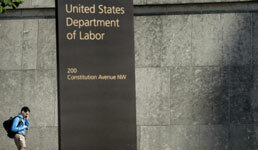 After round two in the legal battle over the Department of Labor’s fiduciary rule, its fate is far less certain, Erin Sweeney writes in InvestmentNews. U.S. District Court Judge Barbara Lynn this week “appeared sympathetic” to the court challenge from nine industry groups including the Securities Industry and Financial Markets Association and the U.S. Chamber of Commerce, according to Sweeney, an attorney at Miller & Chevalier who is following the case. The suit’s primary claim is that the DOL didn’t have the authority to issue the rule, which requires retirement brokers to put clients’ interests first. Lynn also questioned the DOL extensively on another claim of the suit, regarding the “private right of action mechanism” within the rule, which allows investors to sue advisors if they believe their interests weren’t put first, Sweeney writes. That mechanism is part of the rule’s best interest contract exemption, which permits brokers to sell some commission-based products after signing a best interest contract with the client. Lynn also questioned whether the DOL’s argument, that independent agents are aware of possible commissions charged by their competitors, “is something of a wish and a prayer component,” Sweeney writes. In addition, Lynn said she was troubled by the DOL’s studies that linked commissions from annuity products to compensation for selling mutual funds, even though mutual funds are sometimes sold on a fixed-fee rather than a commission basis, according to Sweeney. Lynn said her opinion on the case may be issued within the next month, Sweeney writes. Lynn warned that her “questions are just questions,” implying they should not be taken as any indication of how she will rule, Sweeney writes. Nonetheless, Lynn “appeared sufficiently concerned with the DOL’s process,” according to Sweeney. Earlier this month, the rule withstood the first legal challenge to come up in court, when U.S. District Judge Randolph Moss denied a request from the National Association for Fixed Annuities to delay its implementation. But aside from the outstanding lawsuits, the rule may also be in the crosshairs of President-elect Donald Trump’s administration. Anthony Scaramucci, one of Trump’s campaign advisors and now a member of his transition team, had promised to repeal the rule prior to Trump’s victory. Nonetheless, the industry is deeply divided on Trump’s stance on the rule, as reported previously. And several large brokerages are going ahead with plans to comply with the rule regardless. Capital One, the latest large financial firm to bar commissions on individual retirement accounts, has indicated that it will proceed regardless of potential changes to the rule under Trump, as reported previously.